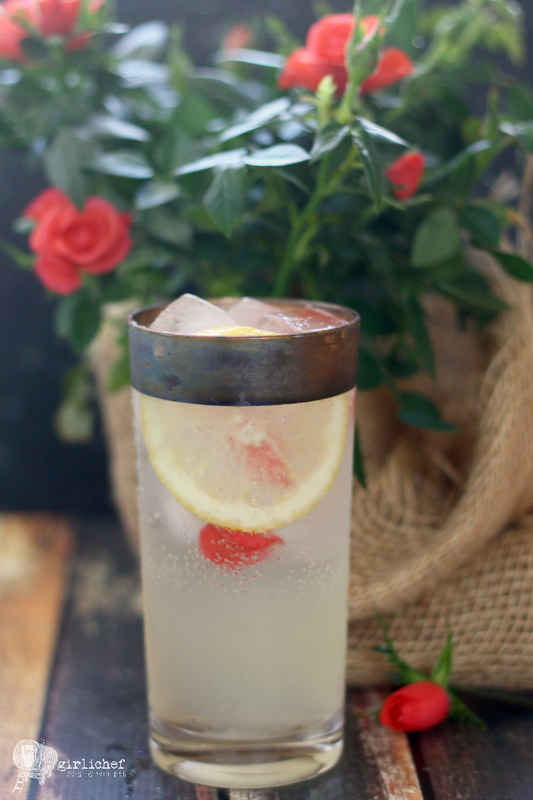 Are you looking for a cocktail to add to your Mother's Day Brunch menu? This one is infused with something we all associate with Mother's Day - flowers! Thank you to thebar.com for helping me share this cocktail with you. When you think "Mother's Day", what pops into your head? I think spring gardens, flowers, breezy get-togethers, brunch on a balmy late Sunday morning, light cocktails. I bet a lot of people have similar associations. Perhaps it's a regional thing, though. You see, living in my part of the Midwest*, Mother's Day usually signals the time to start turning over the earth and reviving your garden because the threat of frost has passed. I can recall many a Mother's Day weekend spent strolling my grandma's flower beds. Of course, it's not just the shoots and vines coming from our own back yards. According to Statistic Brain, $1.9 billion is spent on flowers for mom on Mother's Day. So apparently, most people have flowers in hand when they drop by to help mom celebrate her special day. I've mentioned before that the petal doesn't fall far from the flower in my family. Just like I dream of owning a small bakery or cafe, mom dreams of owning a flower shop or a lavender farm. She's been talking about it since I was a little girl. 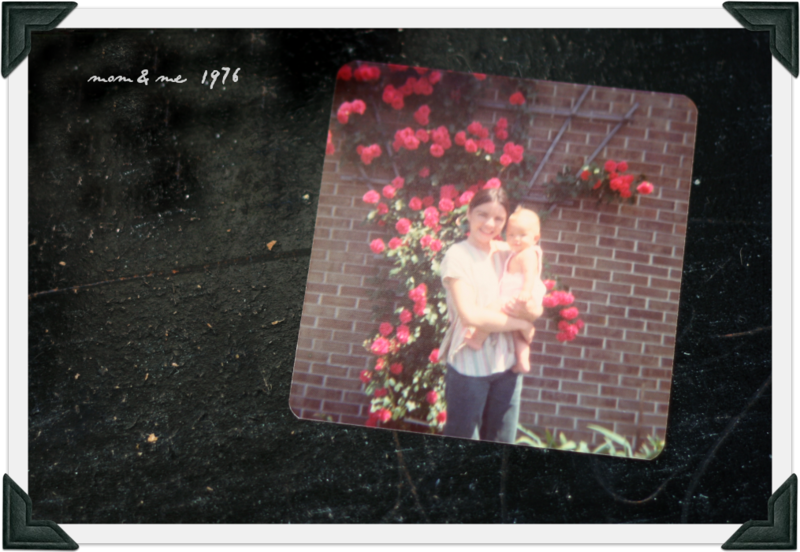 I also love this old photo of my mom holding me as we stood in front of a rose bush in my grandparent's backyard. I don't know exactly when it was taken, but it's very possible that it was my mom's very first Mother's Day; I'd say I look about 6 months old in it, so the timing works. Obviously I associate flowers with my mom. As I was pondering thoughts of a Mother's Day brunch cocktail, my kept wandering back to that photo in front of of the roses. I was looking for refreshing and light, but also memorable. I knew those roses needed to play a part, and I decided that a syrup infused with their floral essence would be just the thing. Gin, with its botanical elements just begged to be the liquor of choice. 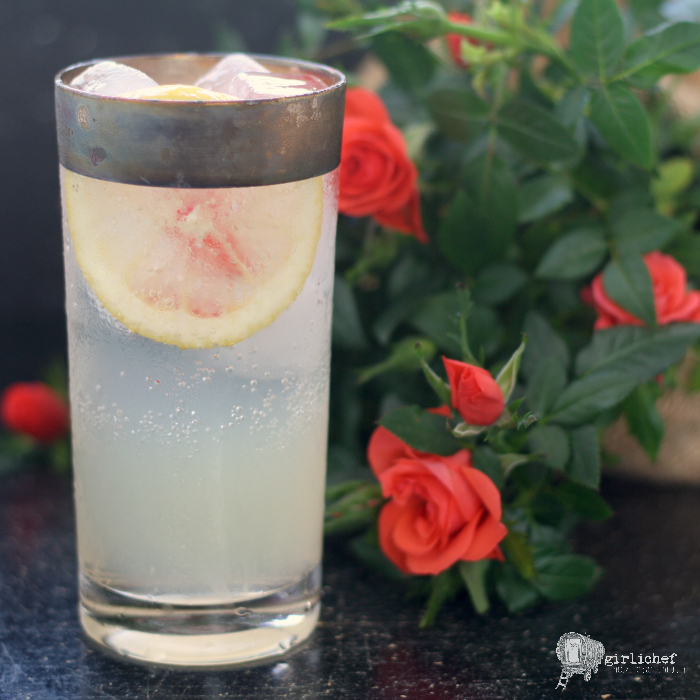 Add some bright lemon and the requisite girl-drink fizz, and the Rose Collins was born. 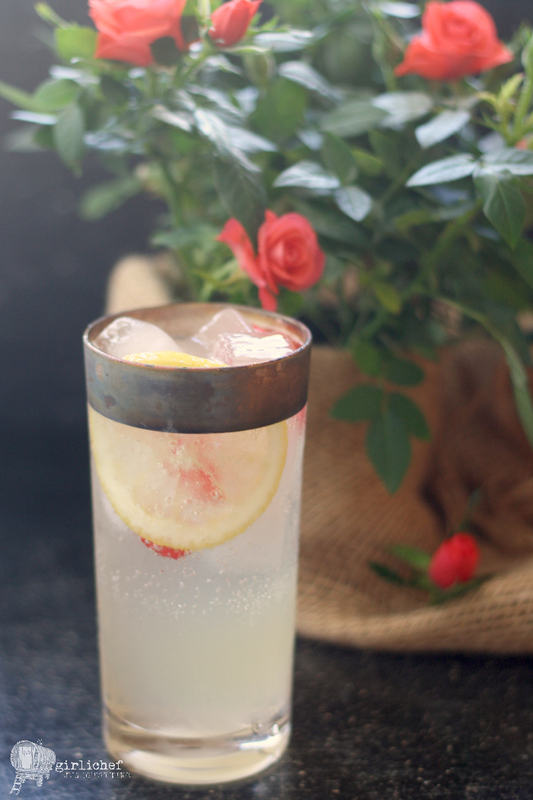 To include this Rose Collins cocktail in your Mother's Day brunch, I recommend whipping up a batch (it doubles or triples very easily) of rose simple syrup the day before and funneling it into a pretty bottle. Set the bottle out alongside bottles of gin and club soda, a bowl of sunny lemons, and an ice bucket. Include a cocktail shaker and some some pretty glassware and you're set. You could also whip up the base and serve it in a pitcher, stirring in the club soda at the last minute. These cocktails would pair well with a Leek and Asparagus Quiche, a fresh fruit salad, Canadian bacon, and some croissants. Some crostini topped with tangy goat cheese and some tender young asparagus spears would lovely, as well. 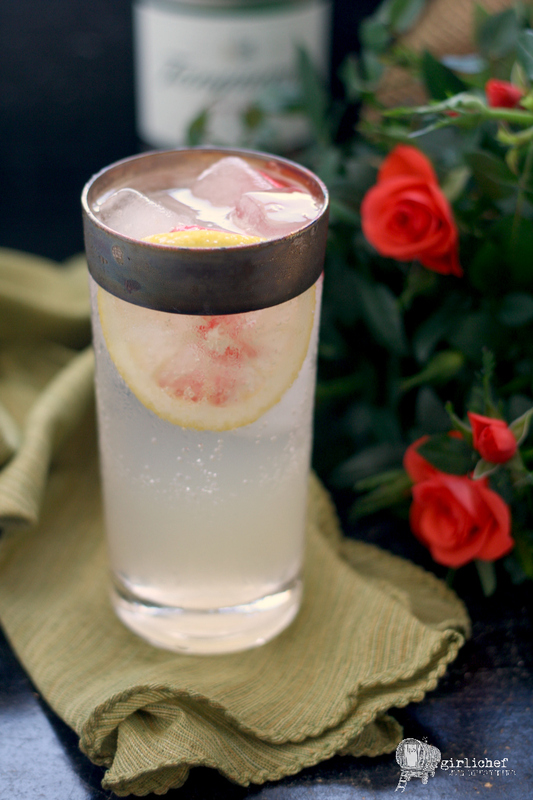 This Rose Collins is a slightly sweeter, rose-infused twist on a classic Tom Collins cocktail recipe. Makes a wonderful addition to Mother's Day brunch. 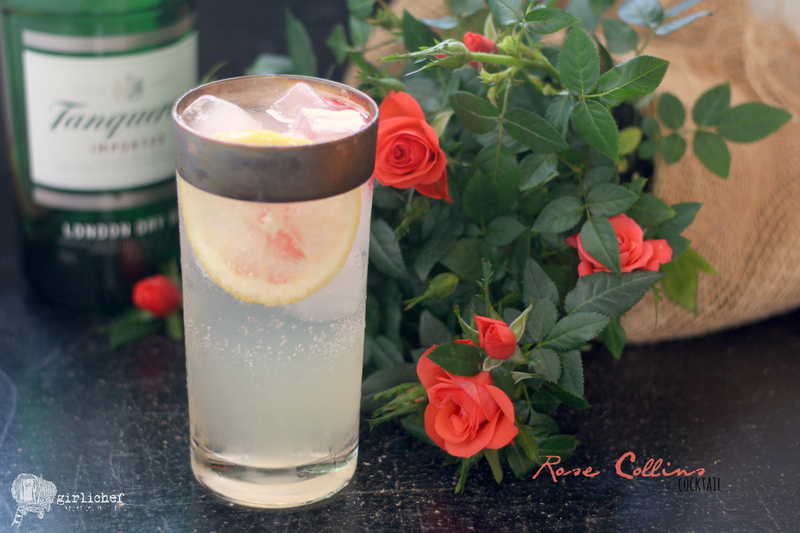 Combine gin, lemon juice, and rose syrup in a shaker filled halfway with ice; shake until cold. Strain into a Collins (or highball) glass that is filled with ice. Top off with the club soda. Garnish with the lemon slice and a few rose petals. Combine sugar and water in a small pot and bring to a boil, stirring until all sugar is dissolved. Remove from heat and stir in the rose water and rose petals, if using. Allow to cool completely. Refrigerate in an airtight jar indefinitely. While the rose petals are optional in this recipe (most of the actual flavor comes from the rose water), they really do add beauty to the presentation. They also add a bit of a blush to the simple syrup, depending on the color you use. Be sure to use petals from flowers that were not treated or sprayed with pesticides. The best place to find them is at the farmers market or in your own yard. *I consider Michigan, Indiana, Ohio, Illinois, and Wisconsin to be "my" part of the Midwest. I received free product and a small stipend to reimburse the costs needed to create and share this cocktail with you. All opinions are my own.